How and Where to Buy Retin A Online? You can buy Retin A through CanadianPharmacyWorld.com at the lowest possible price. We offer RX and OTC medications online from Canada and other countries around the world with a valid prescription from your doctor. Are there Alternative Names for the Brand and Generic Retin A? 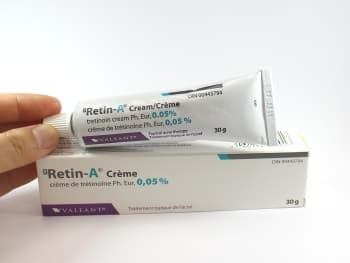 The brand Retin A gel and cream comes from India also called Retino-A manufactured by Johnson & Johnson and from Canada manufactured by Valeant. The generic Retin A cream and also called Tretin Cream comes from India. The generic A-Ret gel comes from India and manufactured by Shalak. The generic Tretinoin cream also called Acnelyse Cream comes from Turkey and is manufactured by Abdi Ibrahim Pharmaceuticals. The Tretinoin is also available under a variety of brand names and dosages and companies. Such as Avita, Vitamin A Acid Gel, etc. What Dosages and Forms is Retin A available in? Retin A comes in the form of cream and gel and in three different strengths: gel 0.025%/30gm, micro gel (0.1%, 0.04%) and cream (0.025%, 0.05%). The generic Tretinoin gel comes in the strengths of 0.025%, 0.05%, and 0.1%. The generic cream comes in the strength of 0.1% cream. Retin A (Tretinoin) is used for the treatment of acne. Tretinoin belongs to a class of medications called retinoids. This medication works by affecting the growth of skin cells. It may decrease the number and severity of acne pimples and promote quick healing of pimples that do develop. The full effects of this medication could not be seen for about 8-10 weeks. What are the Possible Side Effects of Retin A? Are there any Precautions or Drug Interactions for Retin A? You should use Retin A if you are allergic to Tretinoin or to any Vitamin A related medications or if you have any other allergies. Before you start using this medication, talk to your doctor about your medical history especially if you have eczema. Tretinoin may make you more sensitive to the sun. Use sunscreen daily and wear protective clothing when you are outdoors. You should avoid electrolysis and waxing for hair removal on the treated areas while you are using this medication. This medication is absorbed through the skin and may harm and unborn baby. This medication should not be handled by women who are pregnant or may become pregnant. It is unknown whether Tretinoin passes into breast milk. Talk to your doctor before breast-feeding your baby. There may be an interaction between Retin A and other medications such as ciprofloxacin, hydrochlorothiazide, sulfamethoxazole, phenothiazines such as chlorpromazine, etc. Retin A should be stored at room temperature away from light and moisture and out of reach of children and pets. Tretinoin gels are flammable. Keep it away from heat and fire sources.